Bank Nifty opened higher at 27009, registered high 27012 and declined back just after opening by more than 200 points to register low 26764 and finally closed 76 points down at 26862. 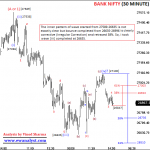 Friday, Bank Nifty was in positive zone as long as trading above immediate breakeven point 26780. Bank Nifty was expected to fall further towards 26377-25990 [support range on 05 Hourly chart] in comings days if breaks and stay below 26780 by more than 15 minute. Trading strategy was to Buy 26500 Put of 06th December expiry if Bank Nifty breaks and stay below 26780 for 15 minutes using stoploss 26951 expecting decline towards 26377-25990 in coming days. 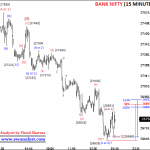 Bank Nifty opened at 27009, declined till 26764 but failed to stay below 26780 for 15 minute. So, our trade was not activated. We need to analyze fresh charts to calculate further move. This is 05 Hourly time bar chart of Bank Nifty covering move from all time high 28388 which I am expecting start of wave  of wave (iii). There is change in wave counts on this chart. 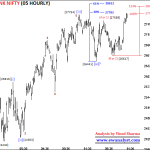 Wave completed from 28388-24240 seems corrective (ABC) type which I assumed as wave  of wave (iii). From low 24240, it seems wave completed from 24240-25915 may be wave (a or 1) although pattern is not clear, wave completed from 25915-24353 may be wave (b or 2) and wave (c or 3) may be completed at 27012 or still in progress. 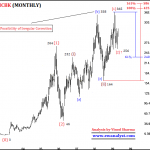 23%-38% retracement of progress of wave (c or 3) is placed at 26384-25996. So, 26384-25996 is short term support and 25996 is short term breakeven point on downside. 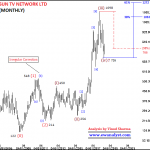 Within wave (c or 3), it seems wave (i) may be completed at 25121, wave (ii) may be completed at 24528, wave (iii) may be completed at 26379, wave (iv) may be completed at 25947 and wave (v) may be completed at 27012 or still in progress. Wave (v) achieved 38% projection after breaking above 26720 whereas next 61%-100% projection is placed at 27199-27973 which may or may not be achieved. 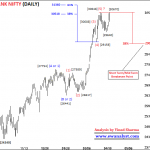 Bank Nifty achieved 27012 till now. Now, let’s analyze wave (v) of (c or 3) started from low 25947 on separate lowest time frame chart to check if wave (v) is completed or still in progress. This is 15 Minute time bar chart of Bank Nifty covering bounce from low 25947 which I am expecting inner wave (v) of (c or 3) on previous chart. 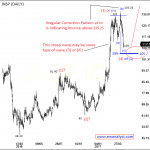 It seems wave (1) may be completed from 25947-26156, (2) may be completed from 26156-26027, wave (3) may be completed at 26580, wave (4) may be completed from 26420 and wave (5) may be completed at 27012 or still in progress. Wave (5) achieved 38%-61% projection after breaking above 26811 whereas next 100% projection is placed at 27053 which may or may not be achieved. 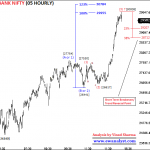 Bank Nifty achieved 27012 till now. 38% retracement of progress of wave (5) is placed at 26785 which is still the immediate breakeven point on downside. 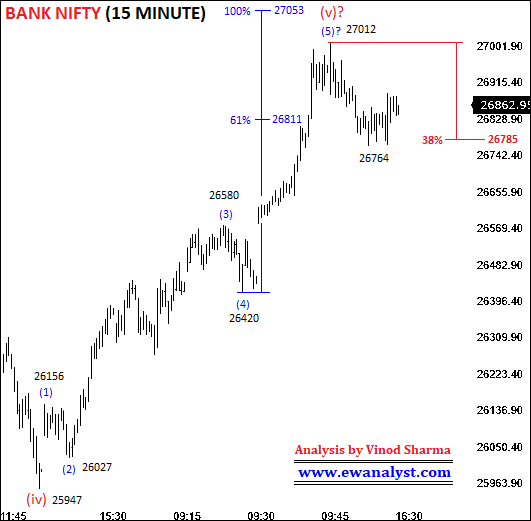 Bank Nifty if breaks and stay below 26785 then further decline towards 26384-25996 can be expected in coming days. There is no change in outlook, 26384-25996 is the short term support and 26785 is still immediate breakeven point on downside. Bank Nifty is in positive zone as long as trading above this breakeven but upside waves achieved all minimum requirements. 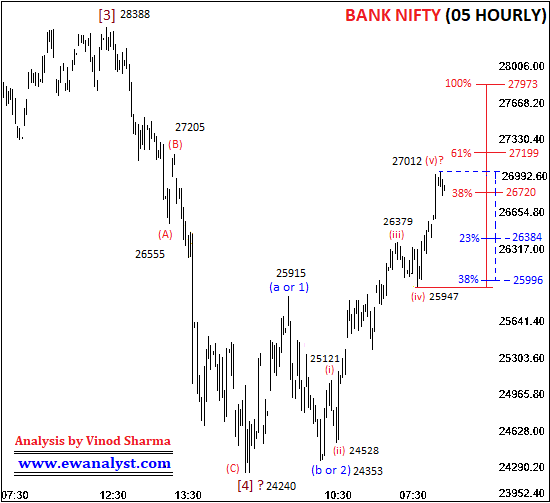 So, Bank Nifty if breaks and stay below 26785 by more than 15 minute can result in further decline towards 26384-25996 in coming days. We need to keep all these conditions in mind while deciding next trade. Bank Nifty if stay below 26785 for 15 minutes then any bounce towards 26785-26900 can be used to buy 26500 Put of 06th Dec Expiry with stoploss of 26951 expecting decline towards 26384-25996 in coming days. Otherwise, Bank Nifty is in positive zone as long as trading above 26785 but I didn’t suggest buying because minimum upside targets are already achieved. These are low risk trading strategy I can suggest in these conditions. Otherwise traders can plan their own trade based on the conditions explained above. 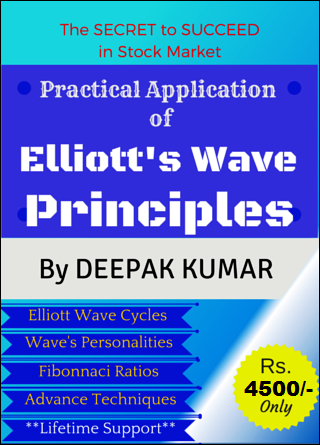 Disclaimer: This analysis report is just for outlook, probabilities and expected markets behavior based on my personal Elliott Wave Analysis. Any trade based on these reports is solely your decision. I will not be responsible for any trade, loss or profit. 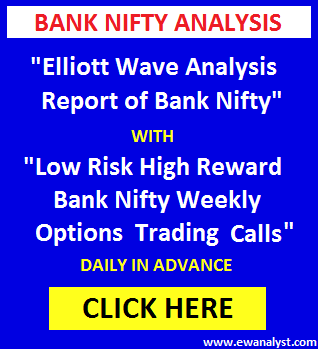 CLICK HERE to get Elliott Wave Analysis Reports of Bank Nifty Daily by Email with Expected outlook, Targets, Stoploss and Trading Strategies.